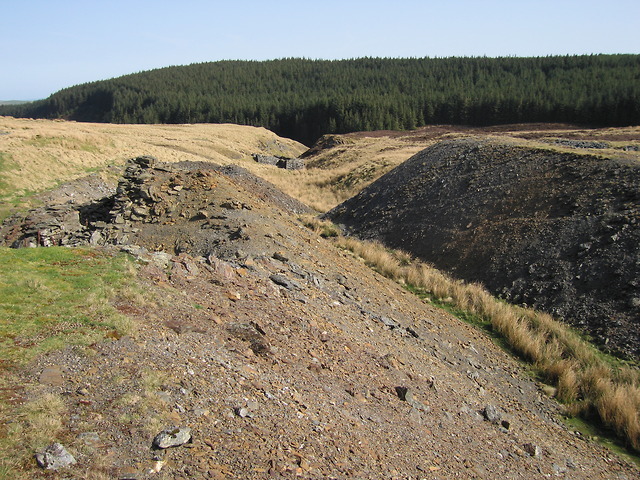 The view follows the Nant Ddu as it runs through the surface structures of Cyfartha mine. The photograph was taken from a spoil tip just west of one of the engine shafts. Another spoil tip can be seen on the right, on the other side of the Nant Ddu. The ruined building on the left is the engine house Link , which would have housed a pulley system carrying a rope down the shaft Link . The shaft itself (now backfilled) is between the camera and the engine house, in the depression beyond the grassy patch on the left. The building in the middle distance is a wheel pit Link which once housed a water wheel driven by the Nant Ddu. The engine house was supplied with mechanical power from this wheel pit using a flatrod system. The engine house Link , shaft Link , spoil tip Link and wheel pit Link are all listed individually on the Coflein database.